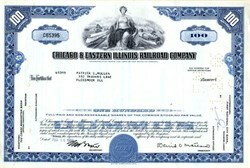 Beautifully engraved certificate from the Chicago and Eastern Illinois Railroad Company issued in 1966. This historic document was printed by the Security Columbian Banknote Company and has an ornate border around it with a vignette of an allegorical woman with a Diesel and Steam Engine her sides. This item has the printed signatures of the Company�s President and Secretary and is over 38 years old. Chicago, Danville & Vincennes (Chicago- Danville, November 1871) Evansville, Terre Haute & Chicago (Danville-Terre Haute, October 1871) Evansville & Terre Haute (Terre Haute- Evansville, November 1854). The basis for C&EI growth was coal. Coal was moved from mines in central Illinois and central western Indiana to Chicago. The C&EI�s growth was closely associated with the growth of Chicago. At the same time, the C&EI was developing itself as a bridge-route between the southern states and Chicago. In the longer run, as the demand for coal dwindled, bridge traffic would prove more economically important to the road. In the early 1890s, the road began building south into southern Illinois. By 1900, the C&EI extended to Thebes, Illinois on the Mississippi River where a ferry connection with the Cotton Belt was begun. In 1904, the C&EI began operating Chicago-Saint Louis passenger service through trackage rights over the CCC&StL (NYC) from Findlay Jct., Illinois to Saint Louis. Then, the C&EI and Cotton Belt spearheaded the construction of the Thebes Bridge. For the C&EI, the strategic fallout of this action was tremendous. The Frisco, threatened by the alliance of the C&EI and Cotton Belt, proceeded to take over the C&EI on October 1, 1902. This ended the expansion of the C&EI. The bridge itself was completed on April 1, 1905. For the next eight years, the Frisco exploited the C&EI through exorbitant dividend demands, and the rental of C&EI equipment at below-market rates. When the Frisco entered bankruptcy in 1913, so did the C&EI. The C&EI physical plant was in poor condition following the Frisco. Frisco control also had another effect on the C&EI: it gave the C&EI steam power its handsome Frisco-like appearance. During World War I, C&EI traffic boomed, but the C&EI remained in receivership until January 1, 1922. When, at last, the C&EI was returned to private hands, the secondary Indiana line was spun off as the Chicago, Attica & Southern. The ill-fated CA&S was entirely abandoned by 1946. During the 1930s, the Chesapeake & Ohio began to buy up C&EI stock, never exercising any significant control over the road it seems. In any case, because of the depression, the C&EI again entered receivership in 1933, but was back in private hands again at the end of 1940. World War II brought prosperity to the property, and in the immediate war years the C&EI modernized rapidly. For example, the road was entirely dieselized in May 1950, making it the first dieselized road with more than 1000 miles of track. But, modernization was not enough to assure survival; with mergers taking place all around it, the C&EI found its traffic drying up. The C&EI needed to merge too. Various merger offers were explored, and again, it was a southwest road that found itself threatened by these overtures. In 1961 the Missouri Pacific began secretly (and illegally) buying C&EI stock. When the Missouri Pacific requested ICC permission to takeover the C&EI, the federal agency turned a blind eye to the illegalities; approved the takeover of the C&EI with the stipulation that the Evansville line be sold to the L&N; and effectively deprived C&EI�s other stockholders of stock profits. In short, the Missouri Pacific got the C&EI for cheap. On May 12, 1967, the Missouri Pacific assumed control of the C&EI. And, on June 6, 1969, the Louisville & Nashville purchased the 206-mile Woodland Junction- Evansville leg along with trackage rights from Woodland to Chicago. Then on October 15, 1976, what remained of the C&EI was merged into the Missouri Pacific. Today, only a very small portion of the C&EI has been abandoned, that being primarily in Southern Illinois and Indiana. At the beginning of the 21st century the ex-C&EI trackage continues to be used by the Union Pacific (ex-Missouri Pacific) and CSX Transportation(ex-L&N). CP Rail also has trackage rights on the line with their acquisition of the Soo Line (former Milwaukee rights). Their Chicago to Louisville trains operate daily on the old C&EI line. The heavily used line from Chicago to Woodland Junction, nearly 50 trains per day travel on double track mainline, is well worth a visit by any railfan. PHYSICAL PLANT: Most rail was 115 lb. Secondary main lines were generally of 90 lb. weight. South of Salem, Illinois rail was 90 lb. Ballast was slag, crushed stone, or gravel for the 800 miles of mainline; cinders for the sidings and yards. Track was in top shape everywhere. MAJOR YARDS: Yard Center (two humps), Dolton, IL; Brewer Yard, Danville, IL; Wansford Yard (new in 1950), Evansville, IN; Baker Yard, Terre Haute, IN; Alice Yard, Vincennes, IN; Villa Grove Yard, Villa Grove, IL; Mitchell Yard, East Saint Louis, IL; Salem Yard, Salem, IL. SIGNALLING: Until 1952, all C&EI trains on the Chicago-Danville line were controlled by Miller Train Control. In fact, the C&EI pioneered this train control system. In 1947 CTC (centralized traffic control) was in operation between Clinton and Evansville, Indiana. The dispatcher�s office was in Danville. Improved manual block was in operation between Findlay Junction and Pana, Illinois with all turnouts interlocked and controlled from Findlay Junction. MAIN SHOPS: The C&EI main shops were located in the eastern part of Danville, Illinois. They were medium sized but well-maintained and modern employing over 1200 workers from the Danville area. Most structures dated from the early 1900s, except the paint shop. Facilities were accessed via a transfer table. The C&EI built many of its own boxcars, hoppers and cabooses here. The diesel shop was one of the best in the country. Today the facility still serves railroad industry as a freight car building for Johnstown America. ROUNDHOUSES: Small roundhouses were maintained at: Yard Center (Dolton, IL); Chicago Heights (CHTT); Villa Grove, IL; Salem, IL; Terre Haute, IN; and Evansville, IN. These roundhouses were used to make running repairs on switch engines, also for the inspection of road units. TRAFFIC COAL: Bituminous coal was the largest volume item for the C&EI constituting about one-third of all traffic. Coal was the primary traffic in the Westville, Salem and Mt. Vernon, Illinois and the Clinton and Terre Haute, Indiana areas. A major portion of the coal generated by mines on the C&EI was destined for Chicago or the barge loading facility at Joppa, Illinois. At one time even the Elgin Joliet and Eastern had rights on the C&EI from Sidell and Westville to Chicago for hauling coal to the steel mills in the Chicago area. INTERCHANGE: Because of the C&EI�s numerous connections, bridge traffic was a major source of revenue. More than half of all freight was for interchange, primarily the Louisville and Nashville in Evansville, the Missouri Pacific and western carriers in St. Louis, the Wabash in Danville and numerous carriers in the Chicago area through the Belt Yard and other connections. The IC, NYC, NKP, and PRR were major connections away from the larger cities. Background from the Chicago & Eastern Illinois Historical Society.